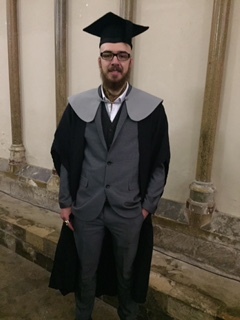 We are pleased to announce our Behavioural Specialist Dave Keaveney-Sheath has graduated from the University of Kent (Tizard Centre) with a first class BSc (Hons) in Autism Studies. Dave has been zealously working in the field of Autism Spectrum Conditions (ASC) and challenging behaviour for the past 8 years, specialising in applied behaviour analysis and positive behavioural support, with management roles in both the private and public sector. He has always been interested in how he could successfully support people with ASC to lead a more inclusive and rich life. It was his inspiration and interest, especially in the areas of positive behaviour support and person centred programming, that gave him the determinative drive to complete his BSc. in Autism Studies through the Tizard Centre – University of Kent. He has previously managed a variety of autism specific schemes ranging from semi secure units to transition and supported living schemes. He has also worked as the training coordinator for a large private care organisation where he was able to gratuitously offer his advice and training to support staff who worked with individuals who expressed challenging behaviour, as a BILD accredited de-escalation and restraint instructor. This is a man heartily committed to person-centred values and he believes that through comprehensive data-driven assessment and intervention, a creative and flexible approach and a real focus on involving individuals in their own support packages, all individuals with ASC may learn, thrive and achieve their full potential.